Mark Pires sitting atop the Gigbox. NEW CANAAN — After years of touring and writing music, Mark Pires invented his own one-of-a-kind instrument — the Gigbox. 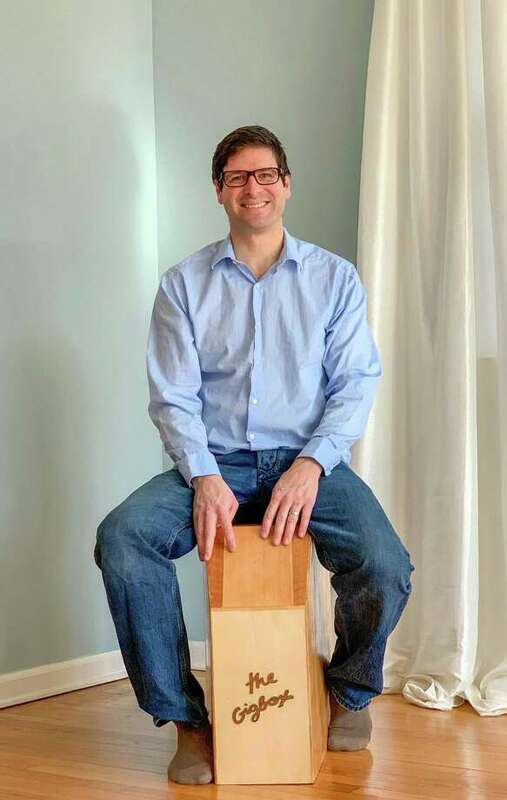 The Fairfield resident graduated from New Canaan High School in 1996 and said his love for music started his senior year while listening to his friend play guitar at a party. He became inspired to learn how to play it himself. After 10 years, Pires was offered a record deal, though he ultimately decided against signing. The idea for Gigbox came to Pires while traveling as a solo artist, and he decided to be a one-man band. While doing a show in Redding, a friend backing him up introduced him to the traditional Peruvian instrument called a cajon. However, when his friend couldn’t make a gig, Pires improvised and made make his own cajon. “I was alone again, so I decided I’m going to build myself a cajon,” Pires said. From there, he would create a completely new instrument — the Gigbox. Designed for comfortability and versatility, the instrument allows users to multitask and function as their own percussionist, he said. The narrow front and wide back allow for a variety of tones, he said. Hitting one side of the instrument can lead to a snare sound, while hitting another can lead to a bass sound. Users of the instrument can also play the Gigbox with both their hands and feet if needed. Later on, while at a birthday party for his daughter, Pires found another function for his new invention — sensory therapy. Pires had brought a couple of prototypes for the Gigbox to the party, and one of his daughter’s friends who had autism was immediately drawn to the instrument, he said. What started off as an instrument for a singer-songwriter, morphed into a potential outlet for children with autism, he said, and the moment inspired him. The price for the instrument starts at $299 and can be found at New Canaan Music on Main Street. Pires said while he plans to have his instrument in every guitar store in the country, he is excited to see it already in his hometown.